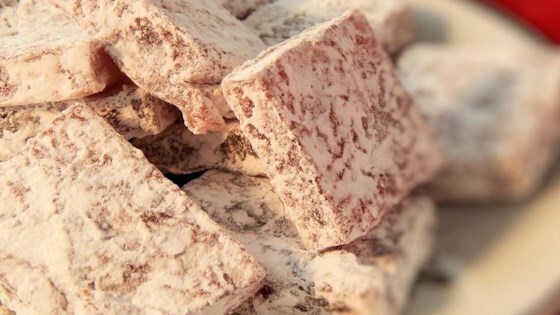 "Turkish delight is a jelly-like candy that has been produced in Turkey since the 15th century. It's usually flavored with rose water, as in this recipe, but you can use any liquid flavor you like. Store in an airtight container." Line a 9-inch cake pan with enough aluminum foil to have it hanging over the sides; spray with non-stick cooking spray and set aside. Stir sugar, water, and gelatin together in a large pot; bring to a boil, reduce heat to medium, and cook at a simmer, stirring constantly, for 20 minutes. Stir rose water and food coloring into the mixture in the pot; pour directly into the prepared cake pan. Cover pan with plastic wrap and refrigerate 8 hours to overnight. Lightly dust a cutting board with some of the confectioners' sugar. Invert cake pan onto the cutting board. Gently peel aluminum foil from the surface of the gelatin. Cut gelatin into squares. Spread confectioners' sugar into a wide, shallow dish. Roll gelatin squares in the sugar to coat. Rose water can be found at specialty food stores, online, or can be made. When cooking the jelly, it may take on a slightly burnt color. This is natural and and will not effect flavor. It does boil over easily, so pick a pan that has plenty of extra space. I followed the recipe to a tee...I made pink rubber.